When I started scuba diving, I became aware of the limitations of an injured body. Every time I carried a scuba tank, the acute pain in my lower back and shoulders increased, and it took a long time for the pain to go away. I did not want to give up scuba diving, so I looked for a solution and found one—diving sidemount. The best time of my life was when I competed in track and field as a teenager, in college and as a young adult. I continue to engage in sports today, including cross-country skiing, snowboarding, table tennis, basketball and many other sports. Injuries I sustained through sports stopped me from fully enjoying these activities. Since 1999, I have suffered from a back injury and have had both my shoulders operated on. When a competitive athlete ages, he or she becomes more susceptible to injuries. Participating in sports requires one’s full focus. The body becomes a machine that must properly function to produce the best results. Keeping the body healthy is extremely important, and the joy of victory over one’s opponents comes with a price. If the individual pushes the body to the limit, it could break. Physical injuries are the worst nightmare for any active person. One might embrace new challenges, but the body doesn’t rebound as quickly. Minor injuries become a problem, and to continue an active lifestyle, one has to consider alternative techniques. I am one of those athletes. Last year, I went to Dutch Springs, located in Bethlehem, Pennsylvania, USA, to practice diving and my photo-video skills. After finishing the dives, I expressed frustration about my pain loud enough for others to hear. Some moments later, Sean Martini—a scuba instructor from The Scuba Connection dive shop—suggested I take a sidemount class. Sean clearly explained the benefits of this gear configuration. He believed using sidemount could solve my issues. I had never even seen a diver in sidemount gear before, but I was willing to give it a try. Dive Rite held a sidemount demo at Dutch Springs in the summer of 2010. My first step was to try it out in the water. Under the guidance of a scuba instructor, we did a 15-minute dive. Back at the surface, unclipping my tanks, I exited the water with just the harness. Finally, a dive without pain. I made the decision right on the spot to take a sidemount workshop. The following week, two of my curious scuba buddies joined me for the sidemount workshop given by The Scuba Connection. Wayne, the business owner and an instructor, greeted us with a smile before starting the class. Manuals, pens and tank rigging parts were laid out around the table and the floor. When I saw so many unknown scuba parts, I doubted if I could remember them all and how to put them in order. The workshop began with the history of sidemount. The configuration was designed for extreme cave divers. Wearing tanks on their side, technical divers could penetrate tight passageways too small for traditional back-mount rigs with multiple stage bottles. Other advantages include two separate sources of gas, with two independent regulators. One also has easy access to tank valves, in case of an emergency. Sidemount allows for a greater range of motion, comfort and vision. Buoyancy and a streamlined profile are easier to maintain. Entering and exiting the water without tanks is another advantage. Petite or aging divers can use different size cylinders. I was already convinced that sidemount was for me. Eager to get into the water, I wanted to experience these benefits over my single tank back-mount configuration. After history and theory, Wayne demonstrated tank rigging. He dressed and undressed a scuba tank, explaining step by step the proper attachment of straps, clips and bungees. My practical scuba friend, Jeanne Chin, brought her camera to record every stage of how to do the tank rigging. It was very helpful for remembering how to rig the cylinders. It was now our turn to rig the tanks. We practiced until it became familiar. On the second day, we hit the water at Dutch Springs. The class began establishing proper buoyancy control, weighting and trim on the surface. When my buddies and I felt comfortable, we ventured out toward the training platforms at a depth of 30 feet. I was overweighed. Wayne kept the Nomad weight plate on my harness with pockets facing out in case the weight needed to be readjusted. Finally, I established my buoyancy and focused on trim. Easier said than done. My legs pulled me down into a vertical position. Two steel tanks on my sides felt awkward. Wayne gently pulled my feet up and my shoulders down, this helped me get into proper trim. My body was tense, and it took some time to get used to this. We learned how to route the hoses correctly and worked on valve drills. Images of rigging tanks from my dive buddy’s camera were burned into my mind. Cylinder removal and replacement in different positions, unclipping the back of the cylinders and pushing them ahead was covered. Wearing a drysuit, heavy undergarments and thick gloves that restricted movement, I had some difficulty clipping and unclipping the tanks and thought the clips were too small. The motion to perform this task made my shoulders ache. When we took a break, I expressed my concern regarding the clips. I asked my instructor to replace the small clips with larger ones. Wayne explained why we needed the smaller clips to keep a low profile and streamline configuration. He said practicing would develop muscle memory, and this task would get easier. However, he agreed to temporarily substitute larger clips to make it easier to attach the tanks. Another issue came up with tanks unclipped and pushed ahead. To keep proper trim with steel tanks brought to the front, a diver must establish buoyancy. I did that, but I could not hold the cylinders for too long. The seven-pound negative tanks were too heavy for me to stay in proper trim. I realized more work had to be done in the gym. We learned advanced finning techniques including frog, modified frog, flutter, modified flutter, helicopter turns and reverse kicking. I tried to mimic the instructor’s techniques but realized more practice was needed. Other skills included deploying surface markers, ascending to a safety stop and maintaining proper trim. It was not an easy task to keep eye contact with my buddy and maintain neutral buoyancy while deploying a safety sausage. The third day was as intense as the previous days. Wayne outlined the day’s plan on the blackboard. We worked on the system’s attachment points adding other gear including lights, lift bags and reels. Gas management was explained in detail, and we performed valve shutdowns and air sharing while swimming. The valve drill was a very tricky part of the workshop. I was instructed to swim to the sunken Sikorsky H-37 helicopter using compass readings; then, penetrate the chopper through the back door; and finally, swim the full length of the helicopter. I was told to be ready for surprises. When I swam in, I saw a flash card suddenly appear in front of my face. It read: “Cutting Tool”. I pulled out a knife from my thigh pocket. “Backup Light”, “Reel” and many other commands followed. At some point, the instructor disappeared from my view. I relaxed, thinking I had finished my tasks for the day. Suddenly, a burst of bubbles erupted from my tank valve. Surprised and shocked, I realized I had a free-flow on my left tank. It took me a few seconds to evaluate the situation. I switched regulators, shut the tank valve and breathed from my right tank. Wayne had simulated the free-flow by sneaking behind my back. Dealing with this kind of an emergency is much easier and safer with sidemount. You could see the valves and operate them without physical obstruction. This is not the case with back-mount. We also practiced donning tanks while floating at the surface and handing them to a tender, or boat mate. After three days of training, it was time to demonstrate what we had learned. This time, I was more relaxed, knowing that I had a redundant gas supply and was more in control of my gear. This lowered my sac rate and allowed me to do longer dives. Because of this workshop, I am a better diver. 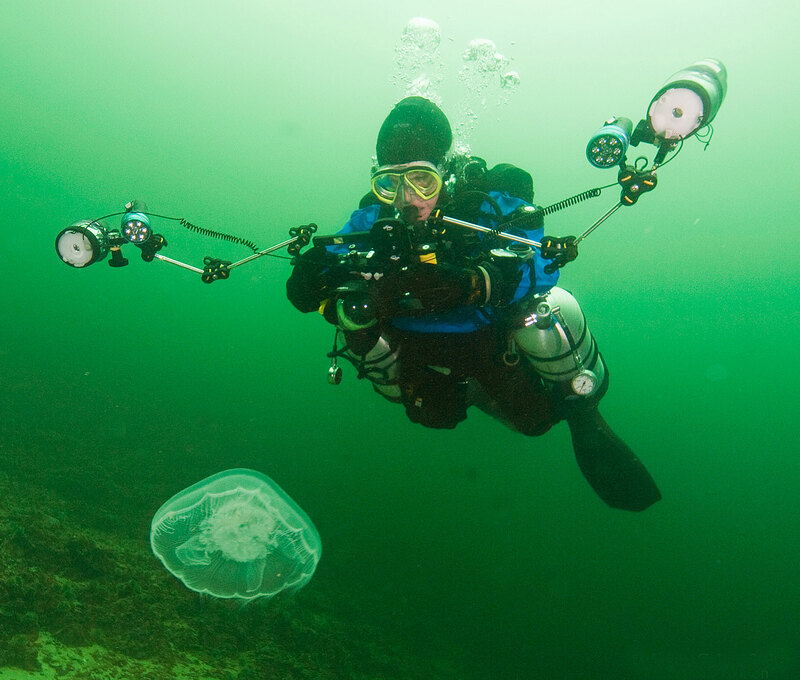 The market offers a variety of sidemount rigs that meet the needs of different environments and personal body types. Divers should be aware of their own needs when selecting equipment. I purchased a Dive Rite Nomad XT sidemount rig because the company has experience with technical dive gear. The super-tough exterior is resistant to punctures and abrasions. The wing provides up to 50 pounds of lift, which is perfect for the steel tanks I use. The harness has a snug fit, which is essential. My instructor and I spent time adjusting the harness to the proportions of my body. I liked the padded shoulder and cross-chest straps for proper comfort and fit. Being a cold-water wreck diver, I appreciate that adjustments can be handled with thick gloves, and I enjoy the flexibility of the attachment points for all my lose gear. When diving off boats, I use an equipment line. I clip off one tank in the water at the end of the dive. This way, I can climb up the ladder where a crew member removes my second tank. This is easier on my body. Besides diving New York/New Jersey’s wreck valley, I have travelled with my sidemount gear to the Thousand Islands, Alaska and Bonaire. Outside of Florida’s cave country and Mexico’s Mayan Riviera, sidemount is not very common. One might expect resistance from dive operators who usually deal with single tank divers. Today, some recreational and technical training agencies offer sidemount courses, increasing the popularity of the configuration.